Another Milia-post break so I can add the next in the ‘Media Journeys’ episodes started a few weeks ago – epiposts? I had a seed sown (read: scribbled on the back of a programme! 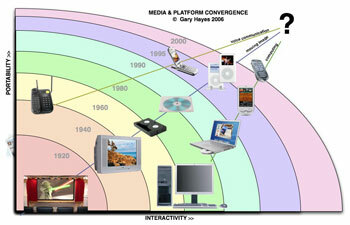 ), during Milia, of a simple evolution of media and associated receiving devices. 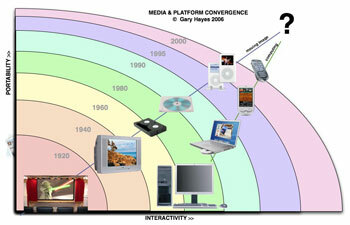 My diagrammatic excursion below is not intended as a catch-all – it doesn’t look at the many media forms across the devices (that is in part 3) but plots time against portability and interactivity and at the same time look at 4 continuum – moving image, computing, voice communication and games. There are other ‘Moore’s law’ elements I would have like to have added but you can take them as read that the big three (storage, bandwidth and processing power) are all increasing up and to the right. Before we continue a couple of important points. 1. This is a blunt, industry perspective so it is intended to be simplistic 😉 2. 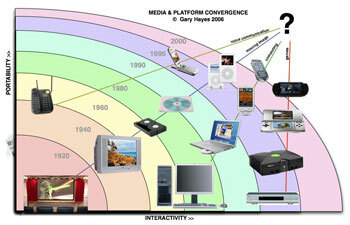 The word convergence is never intended to suggest replacement (ie: everything is moving to one entity, point). ALL, I repeat ALL of the elements on the charts are still in existence and apart from VHS and DVD will be around for a good while. 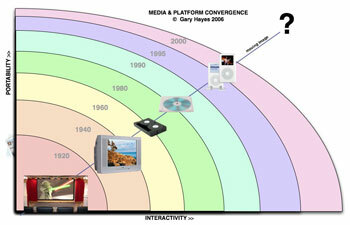 We also see ‘divergence’ of media forms as it morphs across a sea of devices that continue to grow, layer upon layer. 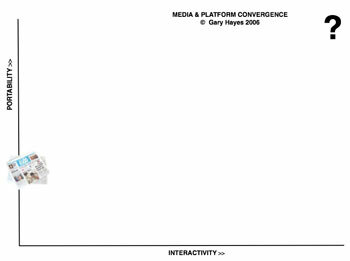 Chart One – Simply the axes of Interactivity (level of choice and engagement) on the x and Portability (personalisation, ownership) on the y. 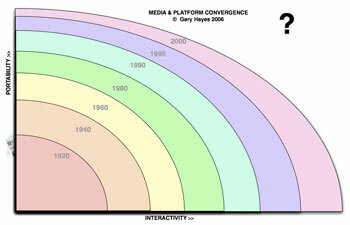 Chart Two – The addition of a subtle chronology rainbow of the last 100 years of media or so. It is surprising when you see the next few charts how the introduction of key devices map exceedingly well against this timeline. The never ending rush to portability and interaction/communication. Chart Three – This is a quite specific ‘moving image’ continuum mapped across the grid. Starting from the one to few cinema in the 20s, from one to many broadcast TV in the 40s, going through the capture and playback VHS and CD/DVD in 60s and 80s through to portable Personal Video Recorders iPods and other media players 2000 onwards. Part metaphoric also for other linear forms as radio/audio follow the same path. Chart Five – Without looking too deeply into VoIP this contains only two elements. The moderately portable landline telephone (meaning you can make calls from phone boxes, cafes, various rooms in house) to the ultra portable true mobile really introduced in the late 80s. Chart Six (click on image for larger version)- The basic evolution of early games consoles and set-tops rooted to the TV then the portable journey to today’s portable games units, from Sony and Nintendo for example. So there we have it if you click on the final chart you will get a higher res version to explore in your own time. A few of the elements don’t line up completely (not sure a video iPod is more interactive than a laptop for example, or all the games units more interactive than communication devices etc:). One could get overly detailed but my real goal is to raise what we actually think the ‘?’ will be. That character on the top right of the chart. In the portable domain will we always have separate phone and serious gaming device. I am not sure. We are already seeing the merging of the phone, organiser and media player (8GB phones around the corner folks) – given you can dock these portable devices to the larger screen, carry all your content and that they can receive high definition TV, do we need fixed devices at all – is there a sweet-spot device? The charts do hopefully raise this point. In Pt 3, I map media forms in a similar way, the difference between individual form, services and formats, keep watching.